The organisation is headquartered in Brussels at the heart of the EU institutions. We work on behalf of our member federations to ensure that the voice of business is heard in European policy-making. We interact regularly with the European Parliament, Commission and Council as well as other stakeholders in the policy community. We also represent European business in the international arena, ensuring that Europe remains globally competitive. Ten political priorities should lead the European Commission and its President Jean-Claude Juncker to improve the investment climate in Europe and encourage job-creating entrepreneurship. 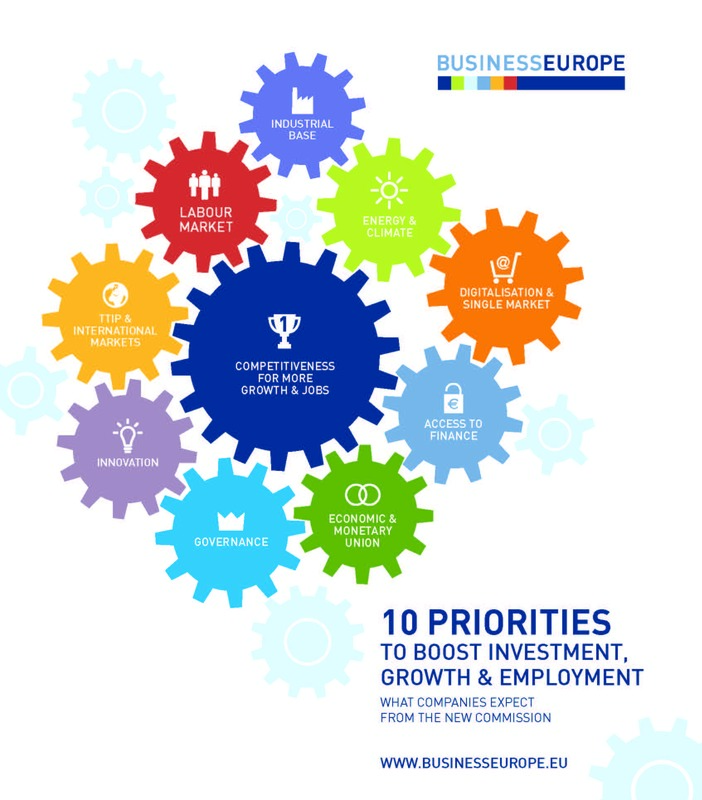 In its message to the new European Commission (28 October 2014, .pdf/2.9 MB), BusinessEurope identified these ten priorities. European companies count on the new European leaders to adopt and implement the necessary measures swiftly to improve competitiveness. Commenting on the publication, BusinessEurope President Emma Marcegaglia said: "Europe is at a crossroads and at the beginning of a new European political cycle. President Jean-Claude Juncker should give a clear priority to competitiveness and well-targeted investment, and insist on reforms. This is the best way to bring more work places to the 25 million unemployed people in Europe today." BusinessEurope Director General Markus J. Beyrer added: "The Juncker Commission should focus on competitiveness and should fully embrace the objective of generating at least 20% of EU GDP in industry by 2020. We need an ambitious trade agenda, better governance and competitive energy prices". 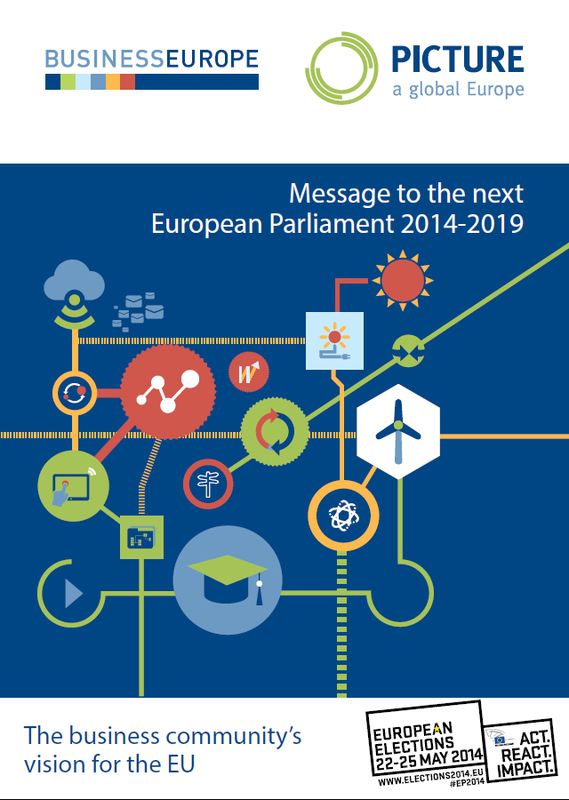 BusinessEurope message ‘Picture a Global Europe’ sets out a vision of the EU in 2019 and calls upon decision-makers to help make this vision a reality. We are convinced that by acting together in the European Union, our economies and societies are stronger. European companies want to invest in Europe and throughout the world. EU policy-makers must help business create the jobs, investment and opportunity that will secure our global future by urgently implementing competitiveness, growth and employment-enhancing policy changes throughout Europe. The BusinessEurope message refers to a number of key policy areas where Europe should improve its performance: energy, innovation, competitiveness, talent, internal and external trade, financial stability and entrepreneurship. It identifies areas where Europe has fallen behind its global competitors and has the potential to improve its performance with a renewed political effort.